Were you told as a kid to not eat snow? Well the American Pipit does not follow this advice! 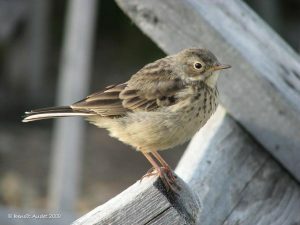 It turns out that pipits use the receding winter snowpack in the mountains as a feeding strategy. They wait for warm valley winds to carry insects upward and onto the snowpack where they die and freeze in place. Then the pipits simply come along and dine on the frozen treats throughout the summer! This episode aired on Saturday August 20th, 2016.